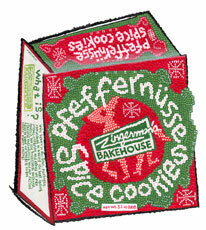 Pfeffernusse Cookie Box for sale. Buy online at Zingerman's Mail Order. Gourmet Gifts. Food Gifts. The Christmas cookie with the best name ever. Pfeffernüsse cookies are traditional Christmas treats in Germany. The name translates roughly as “pepper nut.” The pepper part is because the organic flour-based dough is spiced with cinnamon, nutmeg, cloves, and yes, even a bit of black pepper. The nut part is not because they contain any nuts—they don’t—but because they’re round and smallish and shaped somewhat like a walnut in the shell. Like all of our pastries, these cookies are made with plenty of real butter and eggs, and no preservatives or other unpronounceable ingredients. The illustrated box makes for an adorable stocking stuffer and the 8 cookies inside are sure to bring holiday cheer to even the Bah Humbug-iest of Scrooges.